First Baptist Church. Photograph by A. K. Hoagland, 2011. 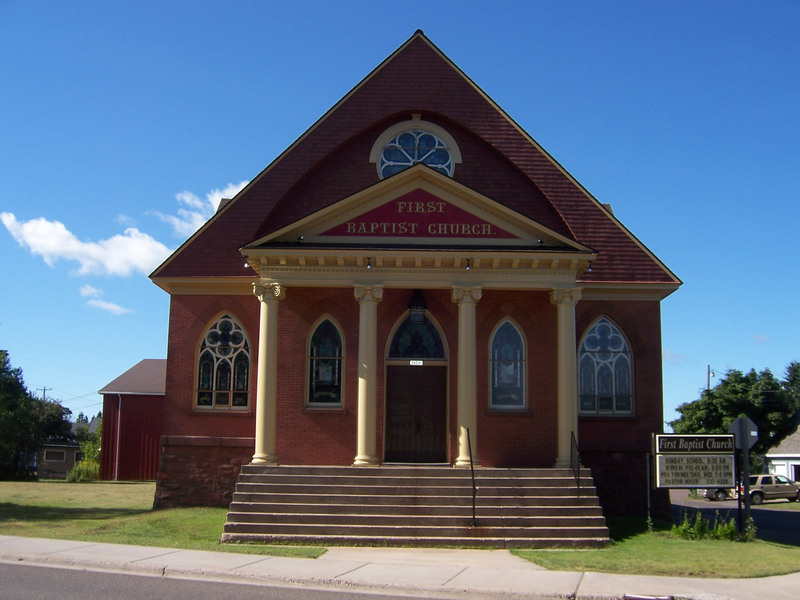 The handsome brick church has a prominent cross-gable roof with arched recesses in the wood-shingled gables. Jacobsville sandstone trims the walls and forms the prominent foundation. Windows and doors have Gothic arches. Four Corinthian columns and a modillioned cornice adorn the portico. Attached to the rear of the church are two additions. In 1968 the congregation added a 40′ x 40′ building for a Sunday school. In 1994 a 64′ x 84′ multipurpose facility was added. Bruce Nolen, “To God Be The Glory” (brochure, 2007).